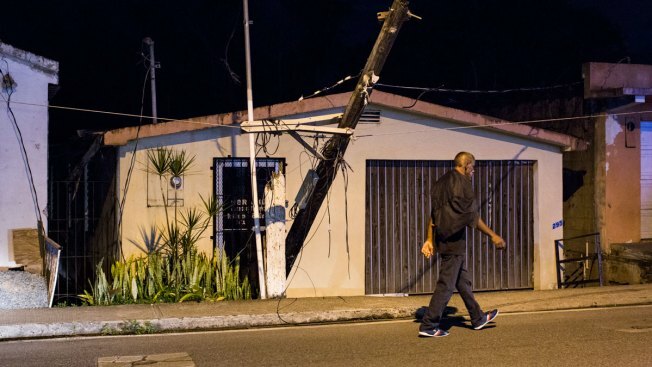 A broken wood electric pole hangs by some wire in Cayey, P.R. on March 1, 2017. The town, located in the mountainous area of the island, has about half of its residents without power. Five months after hurricane Maria ravaged the island hundreds of thousands remain without power and the overall recovery has been slow, a reason that has influenced some to leave for the continental U.S. The U.S. government is awarding $18.5 billion worth of disaster recovery grants to Puerto Rico for its housing, infrastructure and economic development needs after Hurricane Maria. The U.S. Department of Housing and Urban Development said Tuesday it is the largest single amount for such assistance ever awarded. The money will be issued through the agency's Community Development Block Grant program. HUD already had allocated $1.5 billion to the U.S. territory in February for post-hurricane recovery efforts. The Category 4 storm hit on Sept. 20 and caused more than an estimated $100 billion in damage. It destroyed around 70,000 homes and damaged another 300,000. In all, HUD is giving about $28 billion for recovery in nine states, the U.S. Virgin Islands, as well as Puerto Rico. That includes $12 billion for disasters that happened in 2017 and about $16 billion to support places that suffered disasters in 2015 to protect them "from the predictable damage from future events." The funds covering last year's disasters include $4.7 billion for the state of Texas, $212 million for California, $707 million for Florida and $1.6 billion for the Virgin Islands. Others receiving grants are the states of Louisiana, North Carolina, West Virginia, South Carolina. Local governments in several of those states were also awarded the grants, including Houston in connection with flooding in 2015.